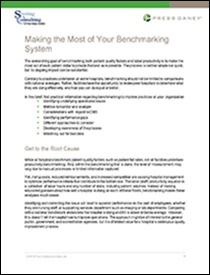 Benchmarking, the process of measuring and comparing the quality, performance, and data services provided, is an essential healthcare performance improvement tool. Efficient and effective benchmarking strategies improve productivity by allowing healthcare organizations to identify and correct issues related to poor performance as well as highlight best practices and trends to deliver high quality and cost-effective services. Read this brief today to ensure that your organization is optimizing benchmarking procedures and implementing effective strategies to avoid negative outcomes associated with poor benchmarking approaches, such as a focus on the wrong objectives, moving in the wrong direction, and wasting finances.